Bartender 1: "I'm going to be thirty." Bartender 2: "I remember thirty." Bartender 1: "Well if my birthday goes right, I will NOT remember thirty." The Fir Cone, now Ernie's Fir Cone, is yet another fine old bar in Shelton -- and a bit of a competitive shuffleboard hub. 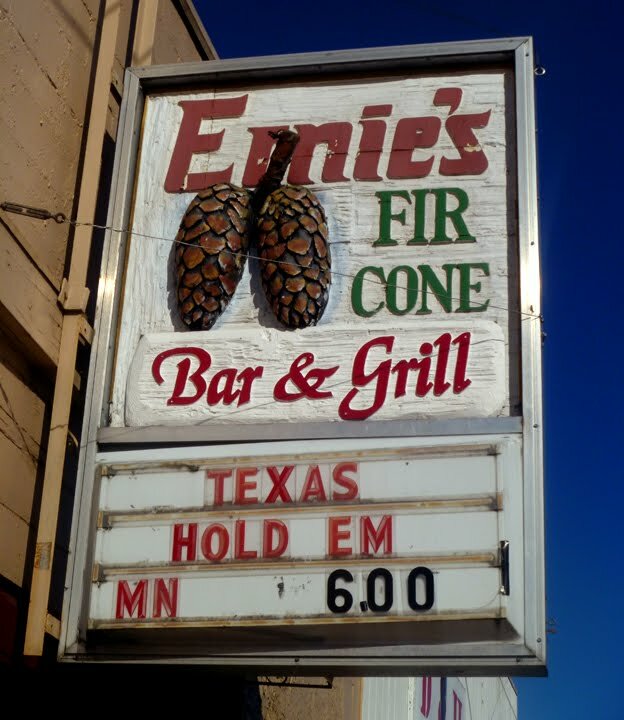 The drinks are cheap but generous pours and the bartenders are nice (and Ernie admits he hires women only). There was an interesting mix of customers the day I dropped in, some appearing rather professorial, and including an old coot of at least 80 in a plaid shirt playing pool with a 20-ish gal in a plaid shirt. I had a nice chat with Wendell, who doesn't drink, but still hangs out there, and who told me about how the bars crowded the downtown streets back when he was a boy and the town was a thriving logging community (which it was from approximately 1855 to 1975). The annual Forest Festivale parade was epic, back in the day, Wendell told me, until they clamped down on it due to excessive drunkedness. 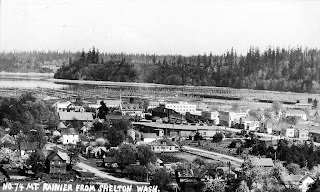 When asked what to do in Shelton of today, Fnarf responded, "Probably the most entertaining thing you can do is to to the Wal-Mart up on the plateau and watch the 18-year-old girls with three kids and their mulletted, jams-wearing boyfriends shopping for shotgun shells and cases of soda." But it seems like you could have some pretty pleasant evenings if you avoid that outer corporate development that has happily left the old downtown area largely intact, and stick to the old bars like the Fir Cone. I do not know the age of Earnie's, but a tavern and cigar shop named "Smith's Cigar Store" is listed at this address in 1960.